At Home With Patricia Wells - Cooking classes in Paris and Provence, Cookbooks and Restaurant Reviews. Today I am excited to announce the dates for the 2020 season of At Home With Patricia Wells cooking classes. Please note that all 2019 dates are full. Be quick as classes fill up fast – we already have many places booked and two classes full as a result of our early bird announcements via our newsletter! Sign up here for future class announcements. In 2020 we are offering two Monday-to-Friday truffle cooking classes devoted to discovering the wonders of the fresh black truffle – the rarest and most exotic ingredient in French cuisine. The session includes an authentic truffle hunt, hands-on cooking classes with black truffles at every meal and in almost every dish, and an extraordinary selection of rare, white Châteauneuf-du-Pape wines. The class is limited to eight students. The fee for each student is $6,000. We can accommodate two companions (a spouse, a significant other, a friend, or a relative who is traveling with the student), who are invited to attend the Wednesday program: the truffle hunt and the restaurant lunch (see schedule below), and the Friday lunch. This is a first-come, first-served option and the fee for each companion is $500. Welcome truffle dinner – Patricia cooks for you! We’ll make a wonderful truffle dinner and then enjoy it together. An authentic truffle hunt with Christian Allègre and his dramatic Laborador, Chou-Chou, followed by lunch at a regional restaurant where the chef is famous for his truffle dishes and his extraordinary cellar of Rhône Valley wines. New-season olive oil tasting, final hands-on cooking class and farewell lunch. In April and May we hold three 5-day Cooking in Paris classes in our Rue du Bac cooking atelier. Each week includes hands-on cooking classes and, on warm days, lunch on our garden terrace plus an olive oil tasting, a bakery visit, a private wine tasting, a market tour and lunch at a Michelin three-star restaurant. The class is limited to eight students. The fee for each student is $6,000. We can accommodate two companions (a spouse, a significant other, a friend, or a relative who is traveling with the student), who are invited to attend the Wednesday market tour followed by the Michelin three-star lunch (see schedule below). This is a first-come, first-served option and the fee for each companion is $500. Hands-on cooking class, followed by lunch! More hands-on cooking, followed by lunch! A guided tour of the famed Avenue President Wilson outdoor market, followed by a sumptuous lunch at a Michelin three-star restaurant. A tasting of olive oils from around the world, followed by hands-on cooking class and farewell lunch. Our ever-popular Sunday-to-Friday Cooking in Provence classes at our farmhouse in Vaison-la-Romaine involve plenty of hands-on, seasonal cooking, sourcing the best produce France has to offer from local markets and our own organic vegetable garden. Classes are augmented with a market visit, oil and wine tastings, and a restaurant meal featuring the very best of the local cuisine and talent. The class is limited to eight students. The fee for each is $6,000. We can accommodate two companions (a spouse, a significant other, a friend, or a relative who is traveling with the student), who are invited to attend the Sunday dinner at Chanteduc, Wednesday wine tasting and restaurant lunch, and the Friday lunch. This is a first-come, first-served option and the fee for each companion is $750. Welcome dinner – Patricia cooks for you! In addition to the classes listed above, we offer the possibility of a private class in Provence for eight persons and two companions, following the format of our regular classes. The organizer will receive a 50 percent reduction in the class fee ($6,000) and in turn assure that all places are filled and that fees are paid on time. If the organizer is not able to fill the class within four months of the start of the class, we may open the class to the public. (And there would be no discounted fees.) Class timings can be flexible within my schedule. For scheduled classes, Sign up here to secure a place in your class of choice. Note that classes do fill up fast and places are booked on a first-come, first-served basis. Now that we have wrapped up the cooking class season for this year, I am back in Paris to immerse myself in the local food scene once again and I am looking forward to updating The Food Lover's Guide to Paris app for the fall and winter. Check the blog, Facebook, Instagram and the app itself for updates. With pleasure and anticipation I announce our cooking class dates for 2019. The season will begin in January at our home in Provence with our spectacular Black Truffle Extravaganza, which includes a special truffle hunt, hands-on cooking classes with fresh black truffles at every meal, paired with an extraordinary selection of rare, white Châteauneuf-du-Pape wines. In April, our popular five-day Cooking in Paris class will include plenty of seasonal full-participation cooking in our new Left Bank garden atelier, a market visit, cheese, wine, and oil tastings, as well as an extraordinary Michelin three-star meal. In June and September, we continue our week-long, hands-on classes of Cooking in Provence at our home, Chanteduc, gathering herbs, fruits, and vegetables from the garden, sipping wine from the vineyard, cooking with honey from our hives, visiting the renowned weekly market in Vaison-la-Romaine, meeting with sommeliers and cheese merchants, and enjoying the local cuisine. MONDAY EVENING: Welcome truffle dinner – Patricia cooks for you! The fee for each student is $6,000. We can accommodate two companions (a spouse, a significant other, a friend, or a relative who is traveling with the student), who are invited to attend the Wednesday program: the truffle hunt and the restaurant lunch (see above.) This is a first-come, first-served option and the fee for each companion is $500. The fee for each student is $6,000. We can accommodate two companions (a spouse, a significant other, a friend, or a relative who is traveling with the student), who are invited to attend the Wednesday market tour followed by a Michelin three-star lunch. This is a first-come, first-served option and the fee for each companion is $500. SUNDAY EVENING: Welcome dinner – Patricia cooks for you! The fee for each student is $6,000. We can accommodate two companions (a spouse, a significant other, a friend, or a relative who is traveling with the student), who are invited to attend the Sunday dinner at Chanteduc, Wednesday wine tasting and restaurant lunch, and the Friday lunch at Chanteduc. This is a first-come, first-served option and the fee for each companion is $750. Sign up here to secure a place in your class of choice. . Please note that classes fill up fast and places are accepted on a first-come, first-served basis. With pleasure and anticipation I am announcing the At Home with Patricia Wells cooking class dates for 2018 (all of our 2017 classes are now full). The 2018 season begins with our spectacular Black Truffle Extravaganza in January, including a special truffle hunt, black truffles with every meal and an extraordinary selection of rare, white Châteauneuf-du-Pape wines. In April we hold three Cooking in Paris classes, followed by my ever-popular Cooking in Provence sessions in my farmhouse in Provence in June and September. All classes involve plenty of hands-on, seasonal cooking, sourcing the best produce France has to offer from local markets and growers and, in Provence, my own organic vegetable garden. Classes are augmented with market visits, cheese, oil and wine tastings, and restaurant visits (in Paris an unforgettable three-star meal; in Provence, the very best of the local cuisine). Classes are now open to the public via my website. Sign up here to reserve a place in your class of choice. Note that classes do fill up fast and all requests are accepted on a first-come, first-served basis. The session includes the Monday welcome dinner, a Tuesday market visit followed by class and lunch, Tuesday evening class and dinner, Wednesday truffle hunt and restaurant lunch, Thursday visit to our truffle supplier, a wine tasting and a restaurant lunch, Friday class and lunch. Each session includes class and lunch, Monday through Friday, as well as a private wine tasting, a market tour, a bakery visit, an olive oil and nut oil tasting, and a memorable Michelin three-star lunch. Sessions begin with the Sunday welcome dinner and end after lunch on Friday. Each course includes Sunday dinner, Monday class and lunch, Tuesday market tour, class and lunch, Tuesday restaurant dinner, Wednesday private wine tasting and restaurant lunch, Thursday class and lunch, Friday olive oil and nut oil tastings, class and lunch. With pleasure and anticipation I am announcing our At Home with Patricia Wells cooking class dates for 2017 (all our 2016 classes are now full). The season will begin, as ever, with our spectacular Truffle Extravaganza in January. In March and April, our popular week-long class Cooking in Paris will include plenty of seasonal hands-on cooking, a market visit, cheese, wine and oil tastings, as well as an unforgettable three-star meal. Our June and September, week-long classes Cooking in Provence, cooking with herbs, fruits and vegetables straight from the garden, sipping wine from the vineyard, visiting the vibrant market in Vaison-la-Romaine, meeting with winemakers and cheese merchants, and enjoying the cuisine of our local chefs. Advance notice of these dates were offered to our newsletter subscribers and those on the 2016 waiting list. The response has been overwhelming, and some classes are now full. If your preferred class is already full, email us to be put on the waiting list, as cancellations do happen. Classes are filling up fast, so don't miss out! Time for cooking classes in Provence! I am looking forward to our opening Provence session of At Home With Patricia Wells this Sunday, June 3. We have a full list of classes planned in June, July, September and October. While most of the sessions are fully booked, a few places are still open for the week of September 16 to 21, and we look forward to welcoming everyone then! You will find full information on this page. To enroll, click here: patriciawells.com/cooking. Braising asparagus --- cooking it in a small amount of liquid, covered -- seems to bring out the vegetal qualities of this sublime vegetable. Adding a touch of fresh rosemary and bay leaf only intensifies its bright, herbal flavors. In this dish, a white cloud of whipped ricotta adds a contrast of textures and colors, while a touch Parmesan, ham, and a shower of fresh herbs turns this into a healthy Salad As A Meal. Equipment: A heavy-duty mixer fitted with a whisk; a large skillet with a lid; 4 warmed salad plates. 1. In the bowl of the mixer, whisk together the ricotta and the milk until light and fluffy. Add the salt and whisk once more. 2. In a skillet large enough to hold the asparagus in a single layer, combine the oil, asparagus, oil, coarse salt, bay leaves, and rosemary. Add enough water to cover the asparagus by about one-third. Cover. Cook over high heat just until the oil and water mixture begin to sizzle. 3. Reduce heat to medium and braise the asparagus, turning from time to time, just until the vegetable begins to brown in spots and are offer no resistance when pierced with the tip of a knife, about 6 to 8 minutes. (Cooking time will depend upon the thickness of the asparagus.) Shower with the lemon zest and juice. 4. Remove and discard the bay leaves and rosemary. Arrange 4 asparagus on each salad plate. While still warm, shower with the Parmesan strips, the meat matchsticks, and herbs. Place a scoop of whipped ricotta alongside the asparagus. Season lightly with fleur de sel. Serve immediately. THE SECRET: The words “serve immediately” are serious here: Once cooked, asparagus go limp rapidly. Much of the joy of this preparation is the crunch of the just-cooked vegetable, so take advantage of it. Variation: Substitute yuzu juice and yuzu zest for the lemon, or braise with the addition of either fresh mint or rosemary, removing the herbs once the asparagus is cooked. Patricia and Walter Wells are especially pleased to announce an exceptional new culinary experience, a weeklong event at Vietnam’s most luxurious resort, The Nam Hai. This special TASTES OF VIETNAM week – May 9th to 14th 2010 – will focus on the best foods that Vietnam has to offer in an extraordinary setting. Guests will stay at the exclusive oceanfront resort on the famous “China Beach,” just outside the storybook village of Hoi An. Patricia and Walter returned recently from a 10-day scouting trip that took them all over Vietnam, sampling the country’s spectacularly light and elegant cuisine. The week will include four full-participation classes with simple Vietnamese menus taught by Patricia and Walter, followed by lunch; daily wine pairings; two afternoon demonstrations by local Vietnamese chefs; two restaurant dinners in the village of Hoi An; a wine tasting with a leading importer; a gala opening dinner and a special beach barbecue dinner at the resort. On one of the days we will travel by boat from Hoi An to the misty Cham Islands, where we will enjoy a beach picnic, featuring produce grown on the islands, as well as freshly grilled fish and shellfish from the South China Sea. Patricia and Walter have selected the premier luxury wine company Goelet Wine Estates as their exclusive wine partner for the week. GWE owns winegrowing properties in Napa Valley (Clos du Val), Victoria, Australia (Taltarni) and the Languedoc, in Southern France (Domaine de Nizas). All of these domains are known for producing extraordinary and balanced wines that express the terroir of their unique sites and are produced specifically to be savored with food. Sylvain Bournigault from Les Celliers d'Asie, one of the foremost wine experts in Indochina will be our host for the wine tastings, which will include a presentation of rare older Cabernet Sauvignon vintages from the library at Clos du Val. The Clos du Val’s inaugural Cabernet Sauvignon vintage, 1973, was among the wines poured at the famous 1976 Judgment of Paris tasting. This vintage, along with Patricia’s reflections on the event that rocked the wine world, will be an unforgettable experience. When guests are not cooking or dining, there is plenty to do at The Nam Hai (www.ghmhotels.com). The resort, opened in 2007, has established a reputation as one of the hottest resorts anywhere. It was singled out by two of the most influential travel publications in the world – Travel + Leisure (USA) and Gourmet Traveller (Australia). The former named it “Best Resort” in its annual design competition; the latter voted it the “Best New Hotel” in 2008. The all-villa resort consists of 35 acres of impeccably landscaped tropical gardens overlooking the South China Sea, 30 kilometers south of Da Nang. We will all be staying in the hotel's pool villas each of which features a private, temperature-controlled pool. Along with a luxurious spa, the Nam Hai includes three swimming pools, four tennis courts, a basketball and badminton court and an adjacent 18-hole golf course, Montgomerie Links www.montgomerielinks.com, designed by Colin Mongomerie. In 2009, Montgomerie Links Vietnam joined the Ho Chi Minh Trail, Asia’s most talked about golfing itinerary. If you are interested in adding a world class golf component as a complement to the course, please let us know. All instruction is in English. Recipes are geared to the recreational cook. Guests are supplied with aprons, a special kit of Vietnamese cooking tools, as well as detailed recipe booklets that are theirs to keep. The class is limited to 20 participants. The week begins with dinner on Sunday night May 9th, 2010, and ends after lunch on Friday, May 14th, 2010. The fee is $6,750 per person for single occupancy and $5,750 per person for double occupancy. The price includes luxury lodging from Sunday night to Saturday morning, all breakfasts, a gala Sunday night dinner, Monday full-participation cooking class and lunch, afternoon demonstration, Monday dinner, Tuesday full-participation cooking class and lunch, afternoon demonstration, Tuesday dinner, Wednesday trip to Cham Islands with lunch, Thursday full-participation cooking class and lunch, wine tastings, Thursday Nam Hai beach dinner, Friday full-participation cooking class and lunch. The fee includes all local transportation and transportation from the Da Nang airport to the Nam Hai. Guests who would like to be accompanied by a spouse/partner who will not participate in the cooking classes can attend for the price of $5,250. DEPOSIT: A non-refundable deposit of $2,000 per person is required to confirm enrollment. FINAL PAYMENT: The final payment must be received no later than January 10, 2010. If the balance is not paid on time, we reserve the right to regard your reservation as cancelled and retain your deposit. Please refer to FAQ’s for information on the cancelation policy, trip insurance, etc. In the event that Patricia Wells must cancel for any reason, all fees, including deposits, will be returned in full. The costs of any travel arrangements you may have made will however not be reimbursed. Only direct bookings are valid. A reservation that is resold to a third party will be invalid and all fees forfeited. The class is designed for adults only. Therefore, students must be at least 21 years old. Most major airlines fly to or have code share agreements to Ho Chi Minh City or Hanoi including Air France, American, Asiana, Cathay Pacific, China Airlines, Emirates, Eva Air, Japan Air, Korean Air, Lufthansa, Qantas, Singapore Airlines, Thai Airlines, United Airlines and Vietnam Airlines. It is a short flight to Da Nang from either Ho Chi Minh City or Hanoi. Interior flights in Vietnam are plentiful. They can be booked on line through Vietnam Airlines or Jet Star, a low cost carrier. If you want to splurge the best routing from the US is LA/New York-Singapore, Singapore-Da Nang on Singapore Air All Business. Please note that you will need a visa, easily obtained through the Vietnamese Embassy/consulates or on-line. It is possible to get one upon arrival but it must be arranged in advance for pick-up. John at Trails of Indochina www.trailsofindochina.com and info@trailsofindochina.com can help with your travel arrangements. They are one of the best travel operators in the region. The course/hotel reservations will need to be purchased directly through www.patriciawells.com . About Clos Du Val Wine Co., Ltd.
French-born winemaker Bernard Portet and American businessman John Goelet founded Clos Du Val in 1972. After traveling the world for two years in search of winegrowing regions of great potential, Portet selected two sites in Napa Valley—150 acres in the Stags Leap District for growing Bordeaux varieties and 180 acres in the cooler Carneros region for Clos Du Val Pinot Noir and Chardonnay. Today, winemaker John Clews joins Portet to craft wines of balance, complexity and elegance. 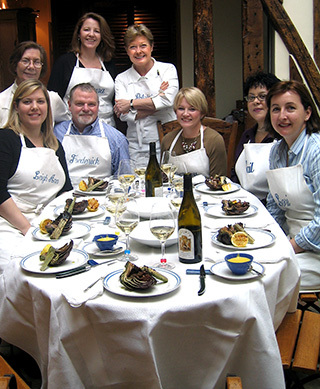 Patricia Wells is pleased to offer a select series of cooking classes in her Paris cooking studio. Located on the charming Rue Jacob in the heart of Saint-Germain-des-Près on the Left Bank, the carefully restored artist’s atelier is designed for cooking and appreciation of the gastronomic bounty of Paris. This five-day movable feast in a comfortable, English-language environment, is designed to bring guests into Patricia’s private food world. Guests cook with the best produce, fish, poultry, meats, cheese and breads to be found in the Paris markets. Each day's program offers something different: the prepared menus shared around the atelier table, the insider's guide to Paris’s markets and boutiques, wine and oil tastings, visits to a baker, and a meal in one of the city’s top restaurants. All instruction is in English. Recipes are geared to the home cook. Guests are supplied with aprons as well as detailed recipe booklets that are theirs to keep. As an additional mid-winter event, Patricia and Walter Wells offer a special Black Truffle Cooking Extravaganza, a unique hand’s on class devoted to the wonders of the fresh black truffle - the rarest and most exotic ingredient in French cuisine. The workshop opens on Monday evening with a truffle dinner at Patricia and Walter’s farmhouse in Provence, in the heart of France’s foremost region of truffle production. On successive days Patricia and Walter accompany participants on a truffle hunt; and tour with them through one of the world’s most important – and still artisanal — truffle brokers, where just breathing the fragrant air is a rarefied experience. Truffles will magically appear in almost every dish prepared during the workshop, and students will have the opportunity to understand the mystery of the black truffle in the kitchen and at the table. Menus focus on complementary wines, particularly the prized whites of Châteauneuf-du-Pape. Wine tastings and discussions throughout the class assure guests of a new understanding of one of the world’s rarest gastronomic joys. All instruction is in English. Recipes are geared to the home cook. Guests are supplied with aprons as well as detailed recipe booklets that are theirs to keep. Fact : One of first estates to bottle their own wine in CDP, in 1815 ! 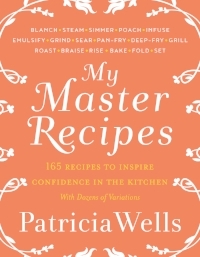 Patricia Wells is a journalist, cookbook author and cooking school instructor living between her homes in Paris + Provence. Thanks for subscribing! We'll be in touch soon. All text including recipes are copyright 2018 by Patricia Wells. All rights reserved. All images on this site are copyright by Patricia Wells, Jeff Kauck or Steven Rothfeld. Do not reproduce without permisison. Site created by Emily Buchanan. 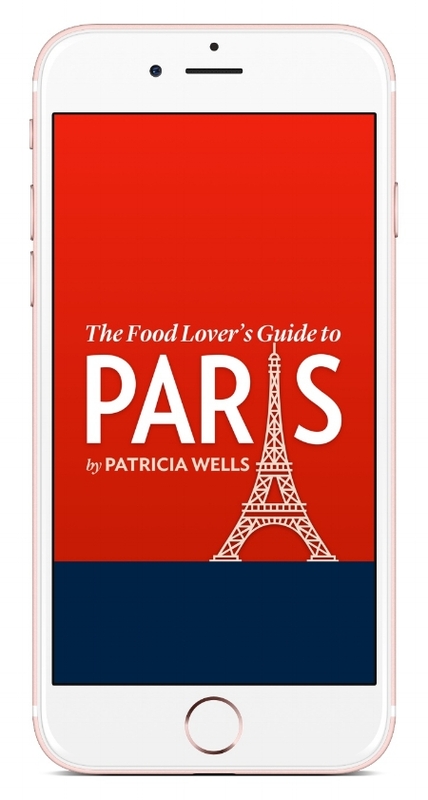 Patricia Wells – journalist, author, and cooking teacher – is an American who has lived in Paris since 1980. She is the author of 13 books, including The French Kitchen Cookbook, Simply Truffles, Vegetable Harvest, We've Always Had Paris...and Provence, Bistro Cooking, Simply French, and Trattoria. Her first book, The Food Lover’s Guide to Paris, was a landmark work that "cracked the code" to the Paris food world. (The Food Lovers Guide iPhone app is available from the iTunes store, and an all new version of the print edition is scheduled for March publication.) She is the only woman and only foreigner to serve as restaurant critic of a major French publication, the newsweekly L’Express. From 1980 to 2007 she served as restaurant critic for the International Herald Tribune. Previously, she was a writer and editor for The Washington Post and The New York Times. She is the recipient of numerous awards, including the Chevalier de l’Ordre des Arts et des Lettres for her contributions to French culture, and received an honorary doctorate from Muhlenberg College in 2013 and another in gastronomic journalism from the University of Wisconsin-Milwaukee in 2007. Several of her books have received the James Beard and IACP awards, and most of them have been translated into several languages. At certain times of the year, she conducts week-long cooking classes both in her cooking studio in Paris and at her farmhouse in Provence. She is married to Walter Wells, retired executive editor of the International Herald Tribune and now her enthusiastic sous-chef.